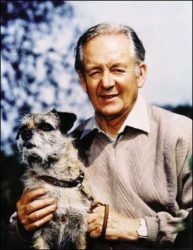 Jim Wight, AKA, James Herriot was born today, Oct 3, 1916.
it says on your site: Jim Wight, AKA, James Herriot was born today, Oct 3, 1916. This is incorrect, I have just read a biography on James Herriott (the main characters name) who is based on ALF Wight the real person and vet who wrote the books. Jim Wight is his father! Although he went by Alf Wight, his full name is James Alfred Wight, or Jim Wight. Also, both his father and grandfather were named James.